For most business we recommend a full service vending program where the vending machines are installed, kept stocked with products and maintained all at no cost. However, for businesses that are too small for a free program or for those business owners interested in buying their own products and stocking vending machines themselves, there are several options available to lease or buy vending machines. Our manufacturing affiliate has a wide variety of vending machines including snack machines, soda machines, frozen food machines, combination soda and snack machines, hot coffee machines, and custom vending machines as well. If the vending machine you want does not exist just let us know what you are looking for perhaps we can have one built! “New” soda or snack machines for about $124/month with a 48 month commitment. You Keep the 100% of the money put into the machine. You decide the snack and soda products to vend and the pricing. “Brand new” state-of-the-art vending equipment. 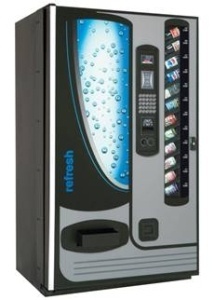 Free delivery and placement of all vending machines. Free membership to the independent vendors association.